SRV Canada VRS is a video relay service that enable Deaf or Hard of Hearing people to connect with voice telephone users via video over the Internet. The system can be accessed from smartphones, tablets, laptops, and computers, empowering communication. 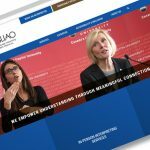 An informational website in both French and English was required to announce the launch of the new service across Canada. A multilingual WordPress CMS was customized for the client allowing them to easily update content and community news. Links to install video relay service applications are made available to website visitors. The SRV Canada VRS system is open seven days a week across Canada bringing those who are Deaf or Hard of Hearing closer together with employers, friends, family, and service providers.